Being in the travel industry has its perks, one of those being that you can travel midweek and sometimes at a moments notice. Our trip to Capella Ixtapa was finalized the day before we left. Why not be spontaneous and escape city life for a few days to celebrate our one year wedding anniversary? We flew Aeromexico with a short layover in Mexico City. For those with a little more advanced notice, Alaska Airlines flies direct from LAX to Ixtapa-Zihuatanejo. The three hour flight makes this part of Mexico a great alternative to the often chosen Cabo San Lucas. Upon arrival, we were greeted at the airport by a Capella representative who showed us to our transportation. After a twenty minute drive through the towns of Zihuatanejo and Ixtapa we arrived at Capella. We were expecting a beautiful resort, but what we found after entering the elegant gates was something that blew away our expectations. There is no part of the resort that doesn't face the ocean, you can hear the waves from every part of the property. Capella Ixtapa is a grand staircase of sorts, descending down the mountainside, each floor a unique step with different offerings. The top level of the resort features the fitness center and several penthouse units. The next floor down is home to the reception area as well as a beautiful library. Again, every spot on the property features 180 degree ocean views. One step further down this staircase of luxury you’ll find the Terrace Bar and A Mares, one of Capella’s fine dining restaurants. Next you’ll find the spa, and after that you reach the main pool level of Capella. Guest rooms are on almost every floor but the bottom pool level. 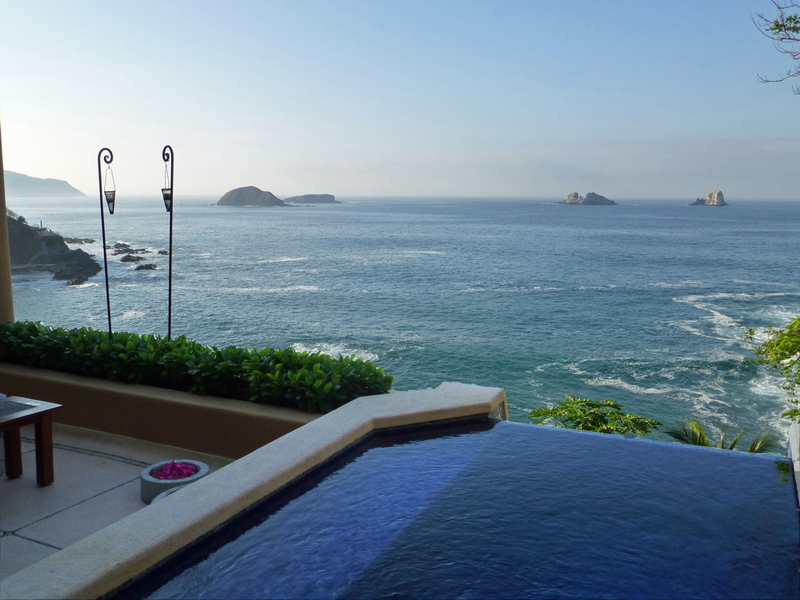 The big kicker: every single room at Capella Ixtapa features its own plunge pool with unobstructed views of the Pacific Ocean. The privacy and scenery offered at this property are truly unmatched. We checked into our Capella Deluxe Ocean Front Suite, greeted with a tray of fresh ceviche and beers... a perfect welcome to Mexico. Every afternoon Capella's turn down service includes two mini cervezas, guacamole, and fresh chips and salsa. Admittedly it was hard to leave our amazing room/patio but we’re sure glad we eventually did. 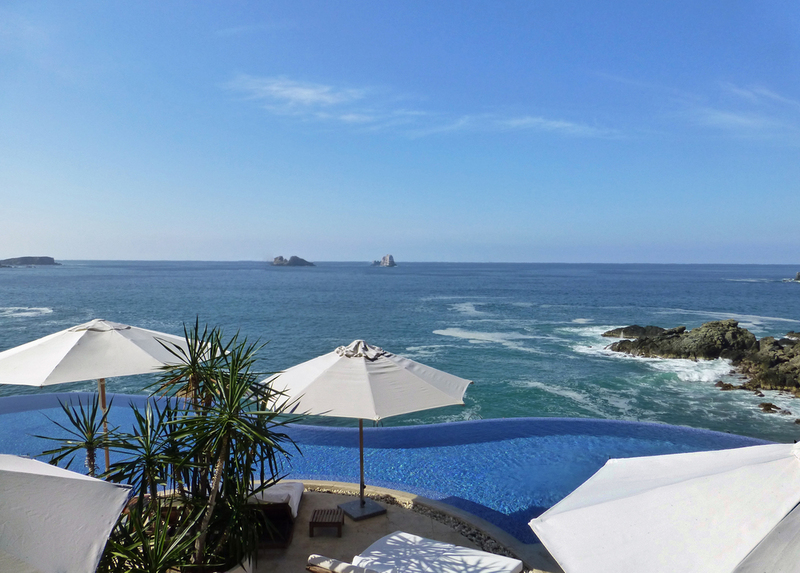 The main pool at Capella Ixtapa is a stunning infinity pool that appears to plunge right into the Pacific. The resort has two pools with one being slightly more secluded. Breakfast is everything you could want and more. Classic Mexican breakfast dishes like Chilaquiles meet modern trends like fresh squeezed green juices. Starting the day off this way was definitely a highlight. We made our way to the Terrace Bar each night we were there. The food was excellent, the drinks were delicious, and the staff was incredibly helpful and friendly. Capella Ixtapa is the perfect place to relax for a few days. However, should you want a bit more activity, the resort offers a number of things to do (cooking classes, sunset cruises, snorkeling trips to name a few). We loved the complimentary mountain bike rentals. From the resort you can bike into Downtown Ixtapa, to a crocodile preserve, or along Ixtapa’s well-kept bike paths winding through the jungle. 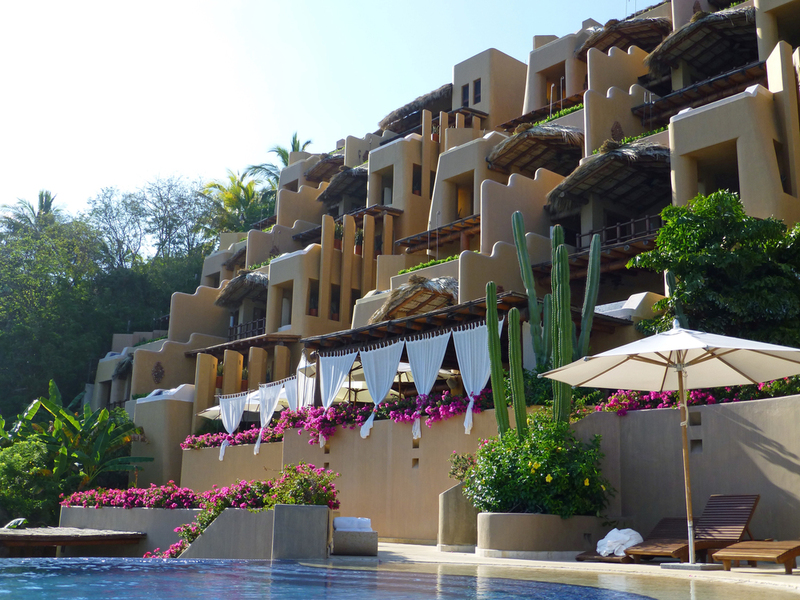 Capella Ixtapa is situated on a rock beach, for sunbathers, the pool is where you want to be. If a beach is what you desire, a short bike ride or taxi will land you on a beautiful nearby white sand beach. On our final night we had a wonderful dinner at Seafood Market. This is Capella Ixtapa’s ocean front dining option. Fresh seafood is displayed, you choose what you’d like to have, how you’d like to have it prepared, and then sit down to enjoy a romantic three course meal. After a few days in paradise, it was time to head home as we had an evening flight scheduled back to Los Angeles. At most hotels you’d have to be out by noon, but this isn’t the case at Capella Ixtapa. The hotel has no set check in or check out time! You are a guest from the moment you arrive until your departure. We have a huge affinity for Mexico and this was our first trip to this region. Celebrating our anniversary here was absolutely perfect. We can’t wait to return to Capella Ixtapa.